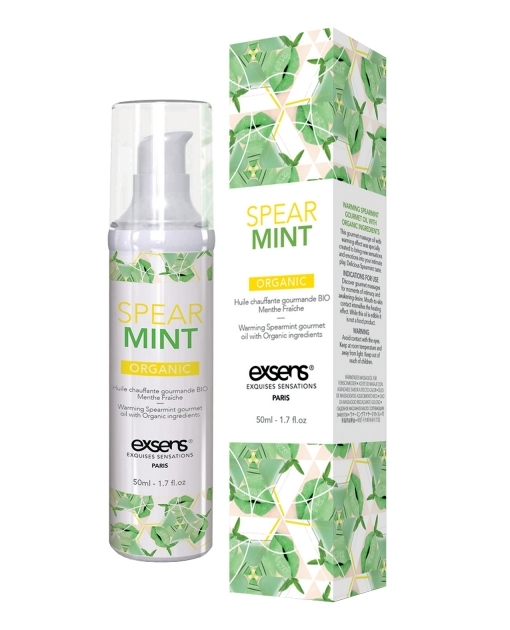 The new organic gourmet massage oil with warming effect from Exsens Paris.Enjoy the natural freshness of mint. Discover gourmet massages for moments of intimacy and awakening desire. Mouth-to-skin contact intensifies the heating effect. 100% natural ingredients. Made with stevia , sugar free with no bitter after taste. Silky smooth, never sticky. No parabens, no phenoxyethanol. Glow-in-the-dark strips on the bottle. Available in 50mL (1.7 oz) airless bottle Ingredients: GLYCERIN*, AQUA (WATER), AROMA* (FLAVOR), REBAUDIOSIDE A *Ingredients from Organic Farming 100% of the total ingredients are from natural origin. 94% of the total ingredients are from Organic Farming.